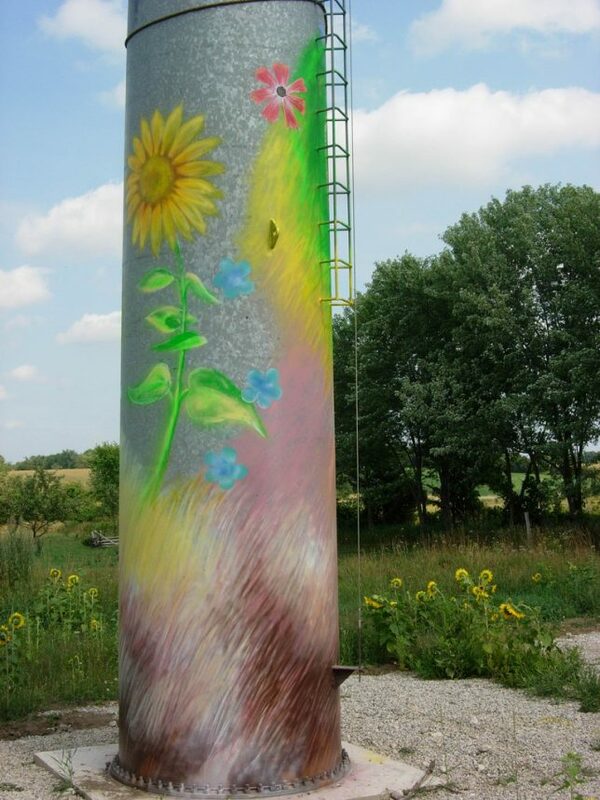 Big fans of artistic expression should check out these creatively painted wind turbines whose cylindrical towers stay green even when they’re multicolored. 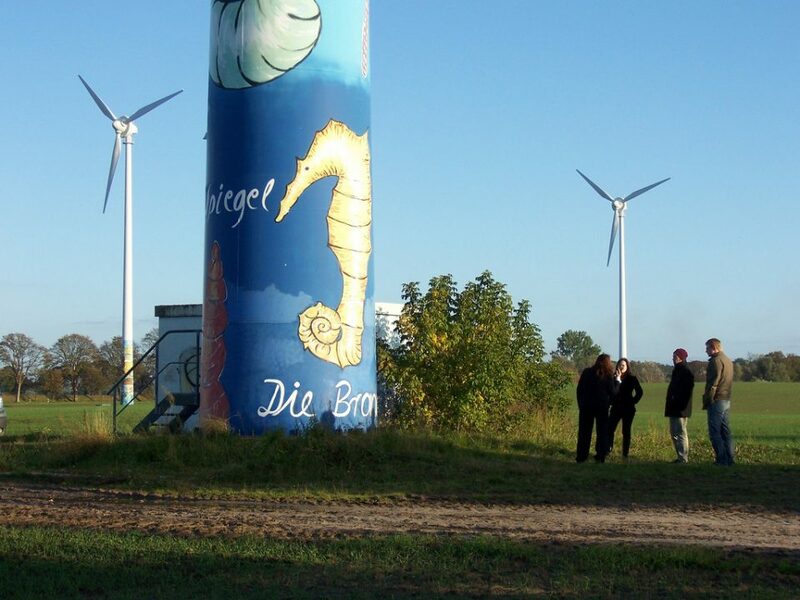 Modern wind turbines pose unique challenges for artists: they’re outside, the “canvas” is an exceptionally tall tube, and anything visible from a distance requires a whole LOT of paint. 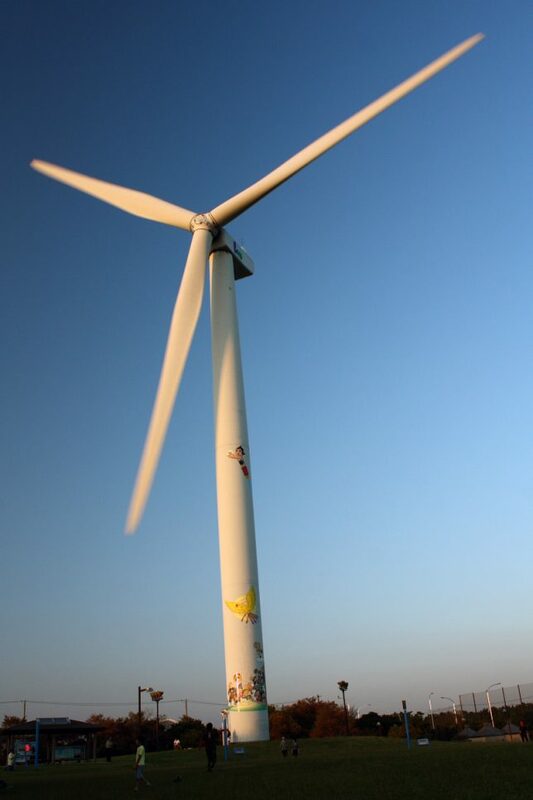 Even so, painting wind turbines provides benefits beyond merely the aesthetic. 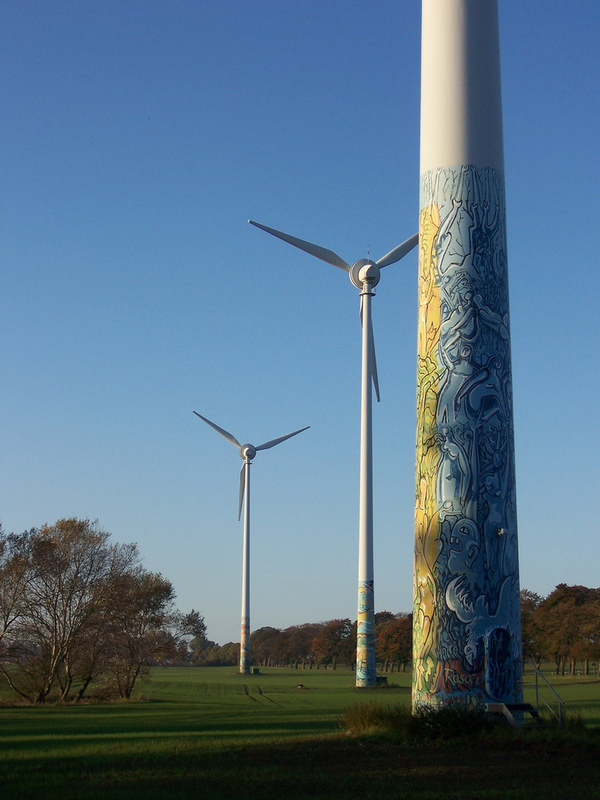 These painted wind turbine towers from Germany, a world leader in green power, were snapped by Flickr member 100ee-Regionen in early October of 2008. 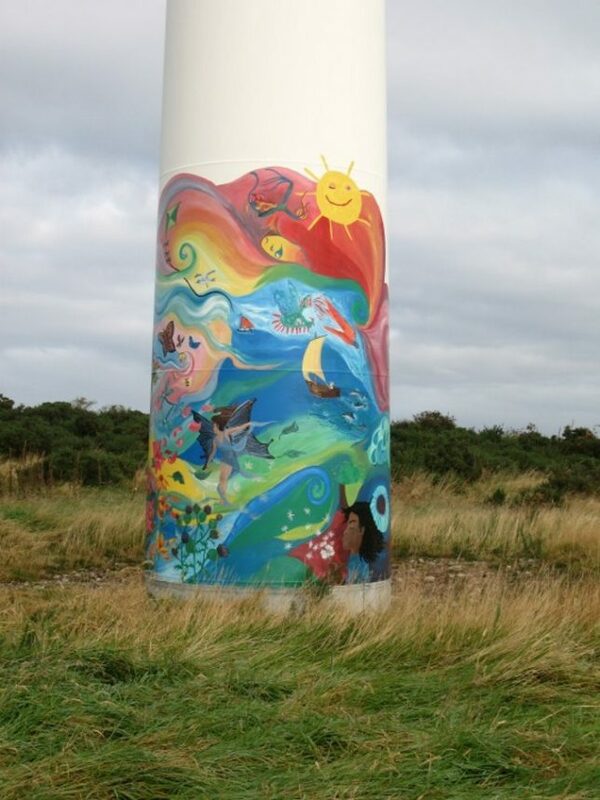 Artist Lisa Shaw, assisted by local groups of children and adults, painted murals on three of the Findhorn wind park’s turbine towers after they were installed in 2006. 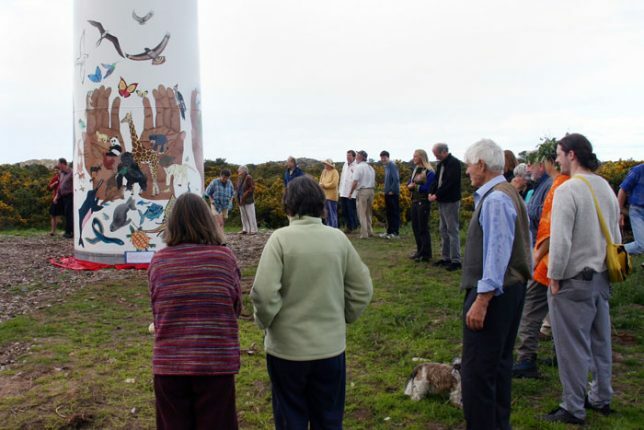 The murals combine educational ecological themes with a pleasing folk-art sensitivity that encourages community members to fully embrace sustainable electric power. It seems Michael Schmidt, “the courageous man fighting the dairy board and health department for the right to distribute raw, whole milk,” according to Flickr member andres musta, has another claim to fame: his wind turbine. 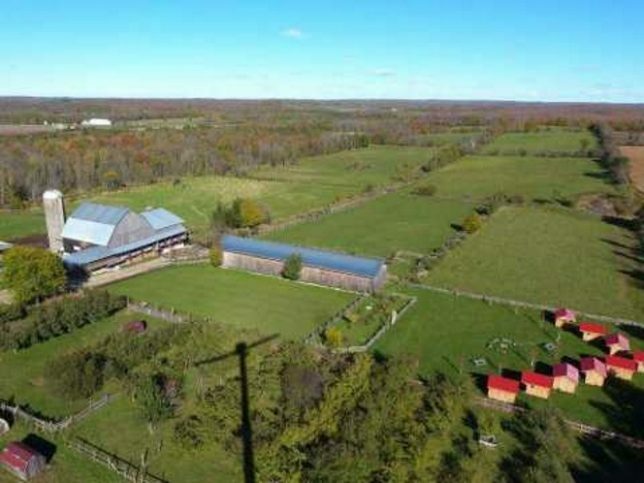 This charming and pastoral painted wind turbine was captured by the photographer in August of 2007 and is located at Schmidt’s 100-acre “herdshare” (kinda like a timeshare but with cows and without annoying sales-people) at Glencolton Farms in Durham, Ontario, Canada. Towering (literally) over Wakasu Kaihin Park, you’ll easily find this 100 meter (330 ft) tall wind power generator in Tokyo’s Koto ward. The giant turbine – one of the largest in Japan and/or in any large urban area – is rated at 1,950 kilowatts of electricity. Bring on the typhoons! 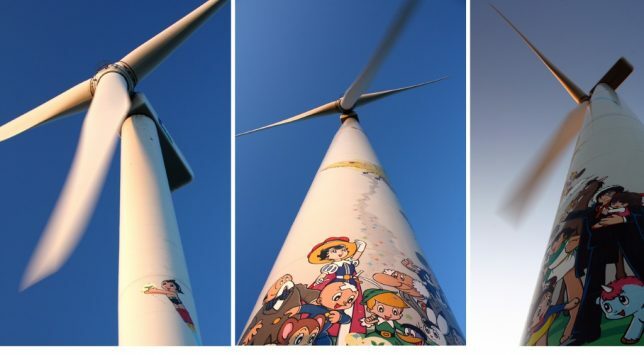 Painted images of Astro Boy (“Mighty Atom” in translated Japanese) and associated characters created by anime legend Osamu Tezuka rise more than halfway up the turbine’s tower. Astro Boy made his first manga appearance in 1952 and the turbine was painted sometime after the tower was erected in 2004. Pink Tentacle profiled this er, windmill with character(s) in October of 2009.